To be able to use TypingTrainer, please consider disabling your ad blocker. Welcome to Typing Trainer, a free touch typing simulator that helps you to master the art of touch typing in a fun and innovative way. Touch typing is a keyboarding technique that advanced typists use to type more accurately and efficiently without looking at the keyboard. After just a few short lessons on our unique application, you will transform the way you use a keyboard forever. This free introductory lesson contains three different modules. In the introduction module, you will learn the basics of touch typing before progressing to our unique simulator to experience touch typing for yourself. 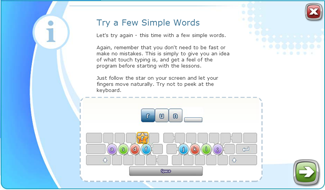 Finally, you will be guided through the process of typing some simple words using the new skills you have mastered. Have fun! Touch typing is a free online tutoring program that can help you learn and improve your typing speed in a fun and effective way. A home-based training system, Typing Trainer teaches you valuable typing skills in just a few hours. Once you have completed some basic exercises, you will be ready to use touch typing in your daily work and can expect your typing speed to reach 11-12 words per minute. With regular practice, it will increase to 50-90 words. What are you waiting for? Start learning how to type quickly and efficiently now! 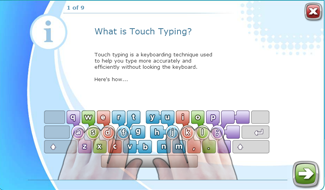 Typing Trainer is a free online tutoring system that helps you to learn how to touch type. Once you have mastered touch typing, you will be able to generate content without needing to look at the keyboard. Through forcing you to look at the screen and not the keys, our visual simulator teaches you how to locate the keys of your choice and touch type with ease. Providing you have an Internet connection, Typing Trainer can be used by anyone at any time. When you start using this home tutor, you will be taught some simple touch typing tricks that will help you to type simple words and get used to the entire tutoring services. As you excel, you will start typing bigger words and will slowly become an expert at typing… the best thing of all? It’s free! With our lessons, you will soon gain confidence in your typing abilities. Typing is easy. All you need to know is where the keys lie and, with a little bit of practice, you will eventually learn how to type without ever needing to look at the keyboard. With a structured approach, we help you bid adieu to your demons and master the art of touch typing. Our guided system makes typing more fun than ever before.